Nearly 100% of users at Blue Margin clients adopt Power BI. Here’s the problem. Every technology initiative starts with a business goal that quickly fades into the mist as features and functionality take over. ... Gartner estimates that less than 30% of BI initiaves acheive their intended goals. 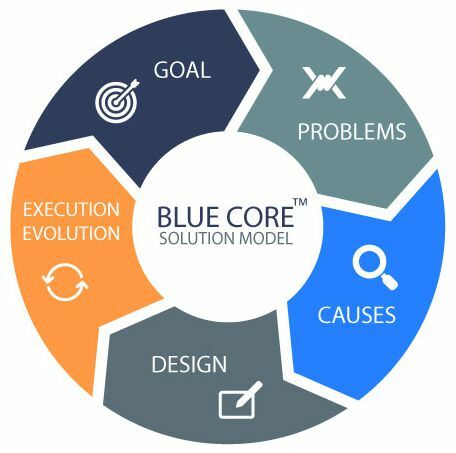 First, we use our BlueCoreTM root-cause analysis to zero in on the metrics (KPIs) that most impact your company's growth and profitability. Then, we define the user-categories, use-cases, and contexts where visiblity into those KPIs will most change behavior to align with the company's success. Next, we deploy dashboards in sprints, iterating as we go to ensure high adoption. Finally, we train and support your end-users, analysts, and data-curators, to make you as self-sufficient as meets your needs. Getting to the roots reveals the simplist solution with the greatest impact. That's what makes Blue Margin different. We obsess over adoption because it's the key to transformation. And the key to adoption is visibility into KPIs that "touch the nerve" and have meaningful impact. We turn conventional design on it's head and deliver virtually 100% user adoption at client companies.